Poor Charlie Crist. His popularity as Florida government may be largely intact, but he’s headed for a massive defeat in the Republican Senate primary. And not massive as in “cash-flush governor gets defeated by little-known cash-strapped upstart”, but massive as in “double-digit blowout”. Crist was in a tough spot — ignore the president’s visit, and be accused of political cowardice. The president is visiting bearing several billion in stimulus funds that Crist requested. Greet the president, and fuel the Rubio insurgency. 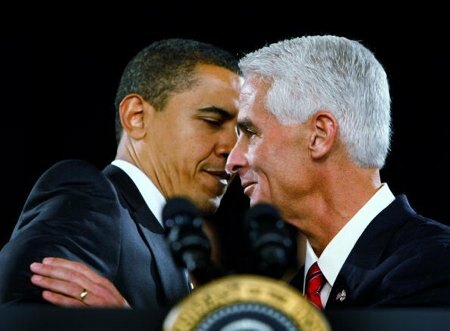 Of course, making it a 27-second handshake makes it that much more delicious for Crist’s right-wing tormentors. What, did Obama grab him in a vice-like grip and refuse to let go? It would be hilarious if he did. There is a way for Crist to avoid all this heartache, of course. Switch parties. He’s dead as a Republican. Florida is too expensive for a serious independent run. Become a Democrat, and he has a fighting chance of ever serving in the Senate. Conservative Democrats signal they wont block public optionSupport for including some version of a public option in the Senate’s version of a healthcare overhaul appears to be solider than initially believed. In a series of comments that have received little attention, conservative Democratic senators — even those who’ve publicly said they oppose a public option — say they are unlikely to join a Republican filibuster to block it. Under Senate rules, Democrats would need to convince 60 members to support the ability to vote on healthcare legislation with the public option (cloture), and then just 51 to pass it. Sen. Mary Landrieu (D-LA) told a reporter earlier this week that she wouldn’t join Republicans in voting against cloture. “I’m not right now inclined to support any filibuster,” Landrieu said. Indeed, Landrieu’s sentiment — that joining foes of healthcare reform would be an impediment to progress — may be the catnip that keeps Democrats on board. Sen. Mark Pryor (R-AR), a moderate Democrat from the South, said Thursday he was open to some form of a government-run health insurance competitor. But regardless of how he votes on the final package, he says he won’t join Republicans in filibustering the bill. Tellingly, he also signaled that he didn’t believe any other Democrats would either. “I don’t think you’ll see me or any other Democrats do that,” Pryor told liberal blogger Mike Stark. One conservative Democrat refused to tip his hand. Nebraska Sen. Ben Nelson (D-NE) occasionally joins Republicans on controversial issues. “I believe in playing chess, but that’s about three moves ahead of me, and I’m not prepared to make those moves until I see some other moves in between,” Nelson told a reporter this week. Jake Thompson, Nelson’s Communications Director, told Raw Story that he “would decline to comment” about how Nelson will react to a potential Republican filibuster. Arlen Specter (D-PA) has said he’ll support a public option as well. Specter defected from the Republican Party to the Democrats earlier this year, against the backdrop of a tough primary challenge from his right. In an interview Thursday evening with MSNBC’s Ed Schultz (video below), he sounded confident that Democrats had the 60 votes to prevail. Sen. Olympia Snowe (R-ME) was the only Republican to join ranks with Democrats in approving a version of healthcare legislation that passed through the Senate Finance Committee. That version didn’t include a public option. That said, Democrats need lose only one member to lose the battle for the public option. A 60-vote majority would also need to include independent Sen. Joe Lieberman (I-CT), who’s tangled with Democrats on various issues in the past. Senate Majority Leader Harry Reid (D-NV) won’t say how many votes he has in his arsenal on a government run plan. In a statement Thursday evening, he said only that he was looking to pass a bill with as many votes as possible. In the House, some version of a public option is almost certain to pass. The version will likely be more liberal than that of the Senate’s, as Democrats hold a larger majority in the lower chamber. President Obama’s position on the public option remains unclear. A Politico report Friday said that Obama prefers a “trigger option,” under which a public insurer would only be created if private insurers fail to meet key pricing standards. The White House, however, says Obama hasn’t taken a position either way. 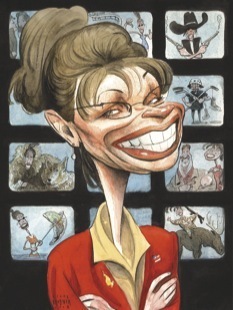 The following video is from MSNBC’s The Ed Show, broadcast Oct. 22, 2009.